A delightful and quirky pair of chocolate shaped silver cufflinks. A perfect gift for your sweet toothed chocolate lover! 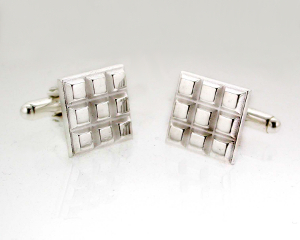 These cufflinks are the perfect accessory for any gentleman in a shirt. These cufflinks have been handmade in sterling silver by skilled jewellers working in the heart of the Jewellery Quarter. Each cufflink has been assayed at the Birmingham Assay office for authenticity, then polished to a high shine finish.